We’ve also spent a good chunk of time getting Ubuntu and Debian images to switch over to distrobuilder. They’re now both building daily on Jenkins and we’re just a few changes to our publication logic away from switching to them by default on the image server. On the LXC side, we’ve done a few last minute cleanups and tagged another beta. We’d still love to get more feedback on the current betas as we work out the last few issues before the final 3.0 release. Fixed a number of CEPH related clustering issues. Fixed automatic placement of containers within a cluster2. Fixed a crash when listing broken containers. Re-introduced an early check for existing LXD daemons. Updated documentation to cover building one’s own liblxc1. Improved performance of privileged container creation on btrfs1. Fixed boolean handling in set_config_item. Fixed clang warning when building without libcap. Fixed configuration to only run mount hook once. Fixed a use after free in the handler. Update Japanese man page after removal of aufs. Fixed a use after free in the tools. Fixed file templating and allowed template chaining. Added an upstart tty generator. Update README.md to match current yaml. Refactored use of rootfsDir out of distrobuilder. Removed useless meta.tar from the tree. Changed pongo2 templating to use YAML tags. Fixed the default values for name and description variables. Fixed distrobuilder to consistently use the kernel architecture. Fixed /etc/hosts LXD generator to also prepend host line if needed. Added support to overriding YAML keys through the command line. Fixed templating to consistently add a trailing newline as needed. Fixed running multiple instances of distrobuilder at the same time. Exported the mapped architecture to templates. Updated README.md to link to CI. 3.0.0~beta4-0ubuntu1 was uploaded, following the upstream release. 3.0.0~beta5-0ubuntu1 was uploaded, following the upstream release. 3.0.0~beta5-0ubuntu2 was uploaded, disabling LVM testing in adt. The beta channel was updated to LXD 3.0.0.beta4. 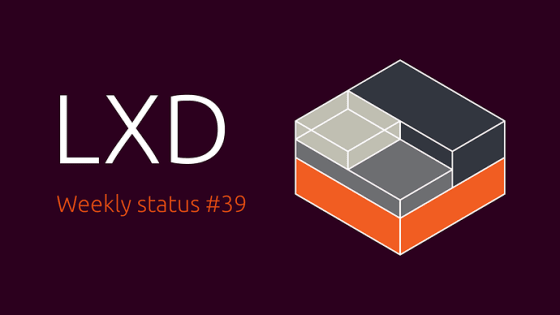 The beta channel was updated to LXD 3.0.0.beta5.